The other day I received my copy of the Handbook of Computational Econometrics. I had contributed an invited chapter on Network Economics and, hence, received my complimentary copy from the publisher, John Wiley & Sons. The Handbook was edited by David Belsley and Erricos Kontoghiorghes. Professor Belsley is a Professor Emeritus of Boston College and Professor Kontoghiorghes is a Professor at the University of Cyprus and Queen Mary, University of London, in England. The volume is stunning and I enjoyed writing my invited chapter on one of my favorite themes. In fact, Network Economics is also the title of the first book that I authored and that also had a second and revised edition. It was the first volume in the series Advances in Computational Economics that Professor Hans Amman and I edited at that time for Kluwer Academic Publishers (since bought out by Springer). I wrote my Network Economics book while on sabbatical at Brown University in the Division of Applied Mathematics (nothing like coming back to your alma mater as a Full Professor and seeing that many of one's professors that one had as an undergrad still looked the same and had many of the same habits, from where they went to lunch, to whom they ate lunch with, etc.). I lived at Wayland Manor on Wayland Square that 1992 year on the Eastside of Providence, and would get up before the sun rose to write my book. It was a magical time! Computational methods (also known as algorithms) are playing an increasingly important role in answering difficult questions in numerous disciplines, including economics. In fact, The Economist, in its July 18-24, 2009, issue (which I have blogged on earlier), which was on Modern Economic Theory -- Where it Went Wrong -- and How the Crisis is Changing It, stated on page 67 that economics requires a revolution in technique and that solving models by hand is insufficient. In fact, research in Computational Economics, which The Economist seemed to, surprisingly, not be aware of, harnesses not only sophisticated mathematical models but also algorithms and their effective implementations to capture the full complexity of economic interactions in economic systems. The Society of Computational Economics was launched over a decade ago and we have an annual conference, a journal, and I have the honor of serving on its Advisory Council for a three year term. The article also highlighted the failure to include banks and intermediaries in economic models (another oversight and not correct statement, and I wrote a letter to the editor making the corrections). In fact, I have not only supervised several doctoral dissertations on this theme but my Network Economics book, my Financial Networks book with Dr. Stavros Siokos, a star in financial practice, and even my Fragile Networks book with Patrick Qiang, ALL have financial network models that include financial intermediaries such as banks! It is time for journalists to become aware of the literature as well as for academicians and practitioners! To ignore the state-of-the-art in model and algorithm development is to move from one crisis to another, blindly!!! It is also time for economists and operations researchers/management scientists to work more closely together, as was the case during the founding of the field of operations research! I am sure that many of those who could not take part in the three days of events memorializing the passing of Senator Ted Kennedy watched part of the services on television and followed the coverage in the press. The timing of his death and funeral coincided with many colleges and universities in the Boston and New England area beginning the new academic year with the freshmen being the first to move into their dorm rooms. Even at Senator Kennedy's memorial service and funeral, his Harvard college room-mate, Mr. John Culver, took part. The poignancy of the memorial and funeral services brought back many memories. Plus, last week I was in Chicago (and both our Governor, Deval Patrick, and our President, Barack Obama, most recently hail from Chicago) where I got to take part in a conference and also to see one of my best friends from Brown University days, Mary Eng, and her family. Noone who goes to college can forget the day of really "growing up" when one is left at one's dorm, meets one's room-mate, and is then on one's own to take advantage of all the great things and special experiences that college brings. I'll never forget moving into my Pembroke dorm at Brown University in Providence, Rhode Island and knowing only a fellow classmate from Yonkers High School and my cousin. But, luckily, friendships were quickly made and ties established through dorm life, cafeteria food, courses, sports, extracurricular interests, studying in the libraries, and other activities (including riding Amtrak to/from NYC for holidays which Mary and I enjoyed a lot, sometimes even sitting in the aisles or between train cars since the cars were so filled). College is an experience like no other and the friendships made there last a lifetime. Brown was very special (indeed, I must have liked it a lot to have earned 4 degrees from Brown but why I stayed through my PhD would merit a separate blog post). I remember my first day at Brown like only yesterday and the same for my "last" day at Brown when I received my PhD. That same day John F. Kennedy Jr. received his undergraduate degree from Brown and I remember seeing his mother, Jackie Kennedy Onassis (and my mother was so thrilled to see her, too). When Dr. Drew Gilpin Faust was selected to be President of Harvard University, I was a Science Fellow at the Radcliffe Institute for Advanced Study at Harvard, and she was then its Dean. We had a special celebration in her honor that Spring of 2006 and Caroline Kennedy attended and I told her how her brother and I had the "same" graduation day from Brown. Of course, you may recall how John F. Kennedy Jr. died tragically with his wife and sister-in-law in a plane crash in a plane he was flying. So, I say to all the students who are starting new chapters of their lives as college students to make the most of those very special years. There are few people besides your family members who will know you as well as the friends that you make in college. As an educator at a public university in Massachusetts, UMass Amherst, I wanted to acknowledge the life and death of our great senator, Senator Edward "Ted" Kennedy. Very few have worked so tirelessly for our great state and nation and his dedication, energy, and outstanding humanity and public service will live on through the legislation that he initiated and shepherded through, and through all those that he directly influenced and connected with. Deepest condolences to all of your family members. I have been immensely enjoying the International Symposium on Mathematical Programming (ISMP), which is taking place in Chicago, August 23-28, 2009. The weather has been clear and crisp and the conferees, when time allows, are taking walks along Lake Michigan, marveling at the beauty of such architectural wonders as the Sears Tower, the Trump Tower, the Wrigley building, and, of course, the Chicago Art Institute (the second largest art museum in the US), and the Field Musuem (where tonight's conference banquet will be taking place). There are many pedestrians on the streets since the weather is simply gorgeous, the busses are running well, the trains and subways flowing on the Loop, and the boats sailing on sparkling Lake Michigan. I have also been very impressed by the lovely flowers and plantings plus the trees that line many of the streets in downtown Chicago, including the Magnificent Mile of Michigan Avenue. Of course, Chicago is a "foodie's" paradise! The invited ISMP session that I organized took place this past Monday and was in the Telecommunication and Networks track of paper presentations. Dr. Mauricio Resende of AT&T Bell Labs was the organizer of this track and I thank him for this opportunity. The session was entitled, "Game Theory and Variational Inequalities," and I packed 4 papers into this session. The session took place in the Gleacher Building of The University of Chicago Booth School of Business, which is located in downtown Chicago, close to Lake Michigan. The room in which we spoke was gorgeous with two computer projector screens, three sliding white boards, and lovely corporate tables and dark green, padded chairs. Yes, the session went overtime, but the audience was willing to give up a part of its coffeebreak -- a true compliment -- to listen to the last talk. As I wrote in an earlier post, two of my former PhD students, who are now professors, Dr. Patrick Qiang and Dr. Zugang Liu, gave talks in my session, with Dr. Qiang speaking on supply chain disruptions and performance and vulnerability analysis, and Dr. Liu giving a talk on our work on electric power supply chains integrated with fuel markets and a large-scale application to New England. I spoke on the Internet as a dynamic network and on network models of oligopolies with insight into the merger paradox. We had terrific discussions with the audience afterwards. I was especially gratified to receive an email message from one of the audience members, which said, Thank you for your beautiful and clear talk this afternoon. This message made my day. Our presentations are available on the Virtual Center for Supernetworks website. The first paper that I presented was based on joint work with Professor David Parkes of Harvard University and Professor Patrizia Daniele of the University of Catania in Italy, and it was published in the journal Computational Management Science. I also included in my presentation additional results obtained with Professor Qiang, in a paper that has recently appeared in Netnomics. Specifically, we showed how, with the use of the new evolutionary variational inequality model of the Internet and the Nagurney-Qiang dynamic network measure, one can identify the most important nodes and links on the Internet and to even rank them! The second paper, as I noted above, was on supply chain disruptions, and captured complex behavior in multitiered supply chain networks under cost and demand uncertainty. This paper is an invited chapter and will appear shortly in a Springer volume, edited by Professors Teresa Wu and Jennifer Blackhurst. The third paper in the session, which I also gave, is in press in Computational Management Science. It extends my work in the network modeling of mergers and acquisitions to the oligopolistic domain, where there is competition among the firms. Professor Liu gave a wonderful talk on our work on electric power modeling and analysis. The scope of the model, which is for New England, included over 500 power generators, and the model reproduced the actual electric power prices very well. This presentation was based on a paper that will appear shortly in the journal Naval Research Logistics. The articles on which our session talks were based are available here. This was the 20th ISMP conference to take place with the zero-th one taking place 60 years ago -- also in Chicago! 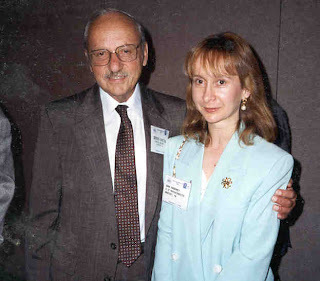 That one marked the historic event at which Professor George Dantzig (see his photo with me below) spoke on the simplex method of linear programming, a revolutionary algorithmic discovery that allowed for the optimal allocation of resources in numerous applications and that is used today by industry, government, corporations, and even the nonprofit sector. Another aspect of a major conference that I appreciate is that you get to see fellow conferees on the streets of the major city, which is the site of the conference. A few years back I attended a Euro conference in Reykjavik, Iceland, which was considered the biggest scientific conference to that date in Iceland, and everywhere that we went we were greeted by "Hi" and "Hello" from colleagues from around the world. In concluding this post, I would like to express my sincerest appreciation to Professor John Birge of the University of Chicago Booth School of Business for organizing such an outstanding conference! Coincidentally, we had the pleasure of hosting Professor Birge in our Spring 2008 Speaker Series. In the post below, I noted that I have organized an invited session, which will take place this Monday, at the Math Programming Symposium in Chicago. In the session, we have a presentation on supply chain risk management and vulnerability analysis, joint with Professor Patrick Qiang of Penn State University in Malvern, and Professor June Dong of SUNY Oswego. The paper that we are presenting on this topic will appear in a new book, out shortly, entitled Managing Supply Chain Risk and Vulnerability, which is edited by Professors Teresa Wu and Jennifer Blackhurst. If you click here, you will also find the table of contents, which includes our chapter, and the chapter by another Virtual Center for Supernetworks Associate, Professor Jose M. Cruz of UCONN at Storrs, who contributed a chapter on network relationships. We congratulate Professors Wu and Blackhurst on the completion of this volume! Here is the preprint of our supply chain risk paper, which captures uncertainty associated with production costs, as well as distribution and transportation costs in multitiered supply chain networks, in which the individual behavior of the decision-makers is modeled, along with the prices that the consumers are willing to pay for the product in the case of random demands. In addition, we define robustness in this setting and provide a supply chain network performance measure. An expansion of this chapter, with additional motivation and case examples, appears in our book, Fragile Networks: Identifying Vulnerabilities and Synergies in an Uncertain World, where we also model network systems and their vulnerability from transportation networks to the Internet, electric power supply chains, and even financial networks! In addition, we demonstrate, how through network integration, one may identify a priori, any possible synergies, which can greatly assist in the evaluation of potential mergers and/or acquisitions. We are getting ready for the International Symposium on Mathematical Programming, which will be taking place in Chicago, August 23-28, 2009. This Symposium marks the 60th anniversary of the 0-th such symposium, which also took place in Chicago. The conference is held every three years. I have organized an invited session on Game Theory and Variational Inequalities, which includes papers on dynamic modeling of the Internet, supply chain network disruptions and vulnerability analysis with performance assessment, mergers and acquisitions among oligopolistic firms and the merger paradox, and the modeling and solution of electric power supply chains with applications to New England. The presenters in this session are: Professor Patrick Qiang, Professor Zugang "Leo" Liu, and yours truly. I have posted the presentations on the Virtual Center for Supernetworks website. This will be a very special conference for me. I recall my first Math Programming Symposium when I was a fairly fresh PhD and the conference was at MIT in Cambridge, MA. My dissertation advisor, Dr. Stella Dafermos of Brown University, had recommended that I attend this conference and I recall fondly my excitement about presenting a single-authored paper on computational comparisons of spatial price equilibrium problems (which later was published in the Journal of Regional Science). I have always loved working at the interfaces of operations research / management science and economics. Lo and behold, a few minutes into my presentation, who comes running into the room, but none other than Professor George Dantzig of Stanford University, who is considered the founder of "operations research." He apologized for being late, I caught my breath, and proceeded with my talk. Afterwards, Professor Dantzig came up to me and told me that he had been working on such problems and he thought that my approach was great. Needless to say, his support and special thoughtfulness and kindness I have carried forward with me from that moment on! Above I include photos of Professor Dantzig with me taken a few years back and also a photo of Professor Stella Dafermos, two giants of operations research (although height-wise they were certainly not "tall"). You can read more about Professor Dantzig, who lived to the age of 90, here. I am delighted that two of my recent PhD students, Dr. Qiang and Dr. Liu, will be with me at this Math Programming Symposium and will be presenting papers. How wonderful to have history repeating itself! I have been meaning to write about why UMass Amherst is GREAT! Today, I had some assistance from the UMass Amherst News Office and we have even more reasons to celebrate. Dr. Kevin Fu of the Computer Science Department, who is an expert on cyber-security (and also an outstanding baker), is the recipient of a 2009 Innovator of the Year Award and will be featured in the September/October issue of MIT's Technology Review. Dr. Fu spoke in our Fall 2008 INFORMS Speaker Series. His presentation was simply outstanding and he discussed medical informatics and even hacking into medical devices and other devices and the associated security issues. He included video clips of surgeries and regaled us with his real-life experiences and the latest research. UMass Amherst today released a press release on Professor Kevin Fu's award and as the Faculty Advisor to the award-winning UMass Amherst INFORMS Student Chapter, I would like to heartily congratulate Professor Fu and to thank him, again, for speaking in our series last Fall. In addition, UMass Amherst issued today the press release on our Fall 2009 Speaker Series in Operations Research and the Management Sciences. We are simply thrilled to have such a distinguished speaker lineup that will include talks on food safety and global supply chains (Dr. Helander of IBM), the financial crisis (Professor Andrew Lo of MIT), lessons learned from Hurricane Katrina (Professor Holquin-Veras of RPI), water reource modeling (Professor Palmer of UMass Amherst), the knowledge economy (Professor Bowles of the Santa Fe Institute and the University of Siena, Italy), and, yes, even a talk on cyber-forensics by a colleague of Professor Fu's - Professor Brian Levine! Complete titles, talk abstracts, and information about the speakers can be found here. Some of you may have seen Science magazine's special issue on Complex Systems and Networks, which was published on July 24, 2009. Coincidentally, that was the same day that I was teaching a course on Portfolio Optimization at Harvard University in its Executive Education AMDP program at the Graduate School of Design. In constructing the material for this course I assembled volumes of relevant literature and also made use of the following books that I had co-authored: Financial Networks: Statics and Dynamics and Fragile Networks: Identifying Vulnerabilities and Synergies in an Uncertain World, and the book, Innovations in Financial and Economic Networks, that I had edited. Information on these books, as well as on my Network Economics book can be found here. In the special issue of Science there is also an article on Economic Networks, in which the authors argue the importance of this theme. However, the special issue has no contributions from the operations research and management science communities who have been principal contributors to the networks literature for over 50 years! Interestingly, last year I was invited by Professor Michael Trick of Carnegie Mellon University to comment on an article published in Operations Research by Professor David Alderson of the Naval Postgraduate School and did so. The article argued for closer collaborations across disciplines in the area of network science. The link to the article along with the commentaries can be found here. Professor Alderson was one of the invited speakers in the Dynamic Networks workshop that I organized with Professor David Parkes of Harvard, under the auspices of the Radcliffe Institute for Advanced Study programs. This workshop brought together physicists, computer scientists, economists, operations researchers, and applied mathematicians to discuss frontier topics in dynamic networks. Last year, I had the distinct honor of being a Fulbright Senior Specialist at the University of Catania in Italy and with Professor Patrizia Daniele organized a Workshop on Complex Networks. Towards the goal of further disseminating state-of-the-art research on networks in economics and finance I am sharing with you my lectures on Portfolio Optimization and on Network Economics, given, respectively, at Harvard University and at the World Bank. Given how many important problems there are in the world to solve it makes no sense to be reinventing the wheel. Disciplines need to give credit where credit is due and to work together. Both my Portfolio Optimization course and Network Economics course lectures highlight the richness and depth of network analysis and what it can bring to the formulation, analysis, and solution of critical problems that we are facing today. Today I received an email message from Dr. Celso Carneiro Ribeiro of Brazil, who is the Editor of the journal, International Transactions in Operational Research (ITOR), that this journal will be added to the list of journals included in the Research4Life Initiative, which provides low-cost access for developing nations to journal content. Wiley-Blackwell, the publisher of ITOR (and our Fragile Networks book, as well), is committed to the Research4Life initiative. In particular, Wiley-Blackwell is a member of the International Association of Scientific, Technical and Medical Publishers and ITOR, with its overarching theme of Operations Research, is applicable to all three areas covered by the initiative, that is, health, agriculture, and the environment. I urge you to read up on the Research4Life initiative and note that the testimonials are very touching. Research4Life is a partnership seeking to help out in achieving the United Nation's Millennium Development goals. I am very honored to be a member of the Editorial Board of ITOR and the paper, co-authored with Trisha Woolley and Patrick Qiang, entitled, "Multiproduct Supply Chain Horizontal Network Integration: Models, Theory, and Computational Results," has now been published online by this journal. Coincidently, Patrick Qiang was my 14th PhD student to complete his dissertation (in May 2009) and Trisha Woolley will be defending her doctoral dissertation, entitled, Sustainable Supply Chains: Multicriteria Decision-Making and Policy Analysis for the Environment, next month. She will be my 15th PhD student, quite the milestone! Trisha Woolley begins next week her tenure-track Assistant Professorship at Texas Wesleyan University in its School of Management. It is terrific to have students who are carrying out research on sustainable supply chains and policy interventions ranging from carbon taxes to tradable pollution permit systems (also known as cap and trade systems). Some of our recent research publications and studies can be found on the Virtual Center for Supernetworks website. My former doctoral students who have conducted research on transportation, supply chains, and environmental concerns have now assumed positions in such universities as the University of Sydney in Australia, York University in Canada, the University of Connecticut, DePaul University in Chicago, and two different Penn State campuses. One of my former doctoral students, Dr. Padma Ramanujam, whose dissertation received the Transportation Science dissertation prize, is with SAS in North Carolina. Needless to say, I am so very proud of all those students, whose doctoral dissertations I have had the privilege to chair! This year, the Bellagio Center, on Lake Como, Italy is marking its 50th anniversary so congratulations are certainly in order! The Bellagio Center runs programs through the Rockefeller Foundation and it has released a special book commemorating the 50th anniversary. I have been privileged to have hosted two events at the Bellagio Center. The first event took place in March 2004, and consisted of a research team residency for two weeks on dynamic networks. The second event took place in May 2008 and was the "Humanitarian Logistics: Networks for Africa" conference, which convened academics, researchers, and practitioners from several continents. Both of these programs that I organized, and for which the Isenberg School of Management is also credited, are documented in this Rockefeller Foundation publication. It is truly worthwhile to explore the special publications with luminous photographs on the Bellagio Center website that mark its 50th anniversary. You may marvel at some of the scholars featured (some of whom have certainly been in the news a lot lately). I remember telling my undergrads at the Isenberg School when my first proposal to the Bellagio Center got funded. One of my students, Cristina Calvaneso (who not only received a Leaders for the 21st Century Award from UMass Amherst, served as a student associate of the Virtual Center for Supernetworks, and who also has had wonderful professional career since graduating in 2004) told her grandmother about this. Grandma was very pleased (but mistaken) and thought that I was going to the Bellagio in Las Vegas! Recently, there has been increasing interest from both researchers and practitioners surrounding humanitarian logistics and supply chains and I have been receiving more and more queries about our research and activities in this dimension. I have updated the website that was created explicitly for the Humanitarian Logistics: Networks for Africa conference to include information on my new book, Fragile Networks: Identifying Vulnerabilities and Synergies in an Uncertain World, with Q. Qiang, and on the book, Humanitarian Logistics, by Tomasini (who took part in my most recent Bellagio conference) and Van Wassenhove. In addition, several associates of the Virtual Center for Supernetworks that I direct have just completed a major study on the design of supply chain networks in the case of humanitarian operations in which there is not only demand uncertainty but partnerships between/among organizations may present themselves. The study documents a new analytical framework, which is network-based, along with computer tools for scenario evaluations and simulations. This research was conducted with tremendous passion and determination since we are reading about the possible escalation of the flu come this fall and the measures that are being taken not only by vaccine and medicine manufacturers but by government, healthcare, and even educational officials. It is critical that top-level research on supply chains for humanitarian needs gets disseminated. Nevertheless, publishing and refereeing take time. At least, we know that we have done our part. Our Fragile Networks book, which includes material on humanitarian operations and supply chains, acknowledges support from the National Science Foundation, the Rockefeller Foundation, and the Radcliffe Institute for Advanced Study, which will soon be celebrating its special 10th anniversary! The Chronicle of Higher Education had a very interesting article recently on "Giving Gifts." When I travel I enjoy bringing back souvenirs for those who have supported me both professionally and personally and who, in general, make life more pleasant. The article noted the giving of books that one has authored as gifts, which is something I have been doing recently since the publication of the Fragile Networks book. As the article states, books are costly, and, hence, their giving and receipt marks a valuable exchange. Reciprocity and gift giving occurs not only in academia but in all cultures. At the very least, those who are acknowledged in one's book, should be the recipients of a copy as well as those who have provided funding for the research that the book is based on. Travel is one of my favorite experiences and is a gift, in and of itself. Academics, typically, engage in travel when they go to conferences since, despite the convenience and accessibility of virtual communications, face to face time really matters in knowledge exchange. Soon, we will be off to Chicago to take part in the 60th anniversary of the Mathematical Programming Symposium, which I am very much looking forward to. I also hope to get a chance to visit some museums since art and beauty feed my soul. Last summer, I presented talks at two conferences in Paris (the Transportation Infrastructure Conference at La Defense and the Computing in Economics and Finance Conference at the glorious Sorbonne). The photos above were taken there. The NY Times had an article recently in which the journalist observed those in the Louvre and the time that they took in admiring the works of art (or not). Interestingly, it was noted that many just bounded through many of the rooms without notice of the beauty of the art displayed. I hope that you enjoy the photos above and also take the time to smell the roses. As psychologists have recently noted it is experiences, even more so than gifts, that leave lasting, pleasant memories. Books, however, as gorgeous paintings, may also last through the ages and be referred back to and enjoyed, time and time again. I concur that the confirmation of Judge Sonia Sotomayor to the Supreme Court of the United States is a testament to the American Dream and a reason for celebrating the possibilities and dreams of those residing in the US both now and in the future. Her story of struggles, growing up in NYC, and being raised by a single mother who worked tirelessly to support the education of her children, plus Sotomayor's work ethic which led her to and through Princeton University and Yale University Law School and now to the Supreme Court is one we should all be celebrating. I have enjoyed reading about Sotomayor growing up as a child -- her love of Nancy Drew books, which I also devoured as a child growing up in Yonkers and now so has my daughter -- her devotion to Perry Mason episodes -- her dedication to her friends and their families -- her exercising venue of walking the Brooklyn Bridge (one of my favorite "city" walks, as well). I watched part of the confirmation hearings on television and was touched by seeing her mother in the audience as well as her brother, a medical doctor. Congratulations to Chief Justice Sotomayor, to her family, and to all of her mentors who helped to pave the way! In this day and age, celebrating diversity matters and so does service to one's profession. I am reminded of the words of past-President of INFORMS (The Institute for Operations Research and the Management Sciences), Dr. Mark Daskin of Northwestern University, who in one of his columns in ORMS Today emphasized volunteerism and also recognized that our professional societies can benefit from more diversity. At that time I had chaired an ad-hoc committee on diversity and our "preliminary" study noted some areas that needed improvement. Obviously, getting nomination packets to recognize females and other deserving members of the professions for various positions, awards, etc., takes time and effort but needs to be done. As a member of an awards committee recently told me at the conclusion of our deliberations: the fact that we are giving this award is a reward in itself and I fully concurred. In celebration of diversity and great achievements, despite what seem, at times, insurmountable odds, I leave you with a photo of the Brooklyn Bridge, to honor Chief Justice Sonia Sotomayor and all those who do their very best. The photo was taken during a walk I took last November while I was at the Regional Science Association's annual conference to give a plenary talk as a Fellow of that society. My co-author, Dr. Zugang "Leo" Liu, and I are very pleased that our paper on electric power supply chains and New England is now officially published and is available online in the journal, Naval Research Logistics; see: NRL. This paper required several revisions and even in its original format was a huge amount of work from the conceptualization of the large-scale mathematical model, the collection of the data, the asking of interesting and relevant questions, the coding of the algorithm(s) used to solve the model -- not to mention the actual writing of the paper, the design and drawing of the figures, including the networks! But the reward for the stamina and endurance needed to finish the paper, revise it according to the anonymous reviewers' and editors' suggestions, is to see it in print. In fact, it already is being cited internationally since it is the first general electric power supply chain network model with fuel markets and data for a large region and the methodology that we use for formulation and analysis is very cool, too -- that of variational inequalities. You can always read up on my Network Economics book to get some background. Our NRL paper can be used as the baseline for the investigation of not only tradable pollution permits (a very hot topic now) but also serve as a model on which smart grid issues can be formulated and studied. Doing this project required true grit, and, just in time, the Boston Globe has a marvelous article on what it takes to be successful -- Grit! I think that you will enjoy reading the article as much as I did and it shows that you just have to stick to what you love and to work very hard at it. However, when it comes to publishing, some highly original research papers can be and have been rejected. This topic alone we can write numerous blog posts on so I will just leave you with the following. You may have heard of a new journal recently founded called Rejecta Mathematica, which considers submissions of papers previously rejected elsewhere. It was founded by graduate students who decided to take action. Indeed, The Economist recently noted that Paul Lauterbur, the father of magnetic resonance imaging, had his seminal paper rejected when he first submitted it to Nature. He later received the Nobel prize for this work. Peter Higgs, the predictor of physics' missing boson, faced a similar experience with the journal Physics Letters (and he is expected to win the Nobel prize). So, the moral of the story is, hard work pays off and don't give up if you believe in your work! Summer is a time when academics and researchers continue to challenge themselves with new and novel professional experiences. These they can then bring back to their classrooms, come the Fall. 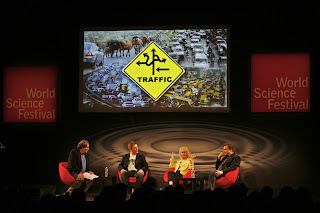 One of the high points of my summer was taking part in the Traffic panel at the World Science Festival in NYC and being among invited participants that included Nobel prize winners, celebrated authors and scientists, and, yes, even movie stars. Such a festival and associated experiences elevate research and discovery and emphasize the importance of sharing and explaining science to general audiences in a fun and exciting manner. Of course, if one loves one's work and my research area of networks, in general, and transportation, in particular, is one of the most fascinating subjects and thrilling to communicate about, taking part in the World Science Festival (WSF) is a true celebration of science with lasting memories that continue to resonate. In fact, even last week, while teaching at Harvard University, the festival came up in discussions! 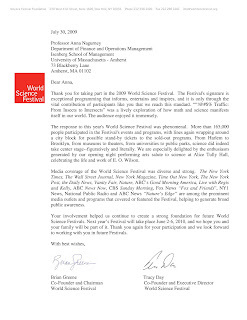 Yesterday, I received a thank you letter (and photos) from the organizers of the WSF, Professor Brian Greene of Columbia University, and Tracy Day, an award-winning journalist. Such attention to detail speaks volumes about their professionalism. Thank you letters matter, as I tell my students, and I try to practice this very important courtesy. In fact, my offices and desks are covered with thank you letters and letters of appreciation that I have received over the years, which serve as inspiration and acknowledgment of extended efforts. The July-August issue of the Association for Women in Mathematics Newsletter has a feature article on my participation in the WSF. Thank you to the editor for this great coverage and for reinforcing the memories of those magical days in New York City in June!